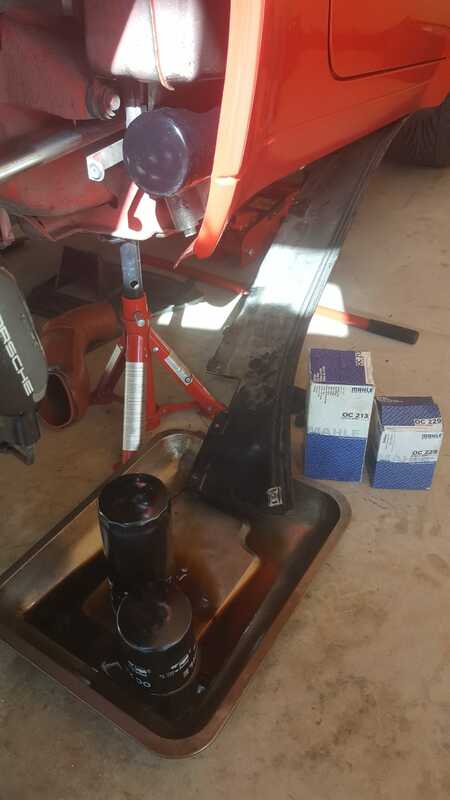 Well it was time for the old annual oil and filter change, all went to plan and I got it done and dusted in 1 1/2 hours, I'm getting good at it now. Only covered 3467 Kms since the last one so note to myself .... need to get out in her a bit more. Anyone got some tips? Mine is a Tiptronic so don't know if this makes it more difficult? I re-attached mine yesterday, you now have me worried, I know the big earth strap from the underbody attaches to the bottom starter bolt. There's another thick wire feed that goes to the solenoid from the main body of the car, that's a direct feed from the battery (+). There's a few smaller nuts/wires on the solenoid. Yes you are correct, the big earth strap is attached to the lower starter motor bolt. On mine there were just 2 heavy connectors, one was on its own which came directly from the battery and the other which had a few more wires wrapped in it connected to the main post of the solenoid along with the battery wire. I think I may have position my wires so that one was touching the yellow wire of the solenoid. Once I'd re-positioned the wires, got it away from the yellow wire I was fine as I said. Hope you put some copper slip on the bolts. 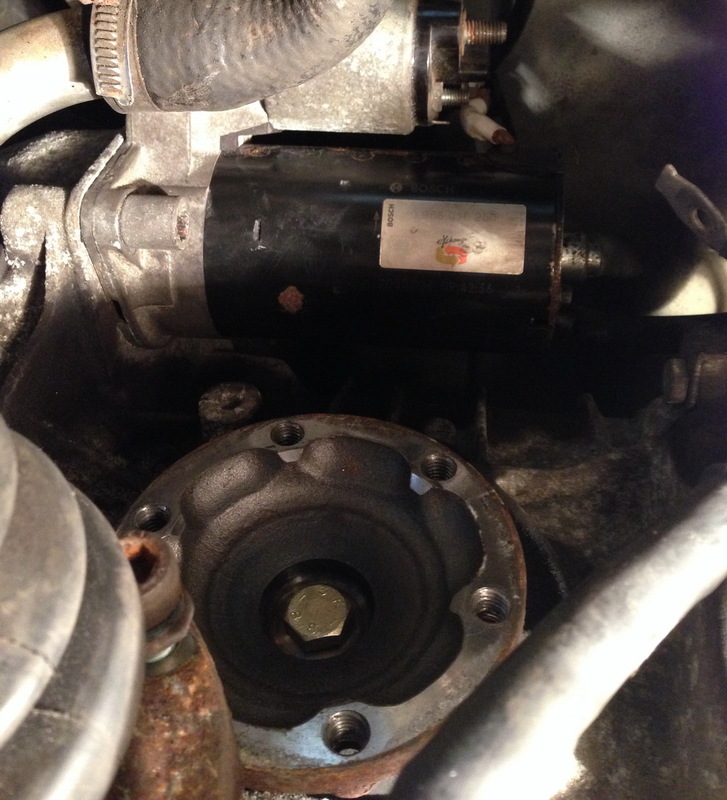 I would recommend removing the driveshaft for better access to the Starter motor lower bolt and ease removal. Also, try different combinations of socket extension to get one just longer than the Starter. This will enable you to remove the Top bolt. I did have a look on Renlist and they showed a similar set up with the socket combination. I've just been out and bought a 3/8" socket set to add to my 1/2" so hopefully I'll now have the right extensions. To be honest I didn't remove the drive shaft. I thought I could get in there with out doing it but all the DIY's say it should be removed so I too will go down that route next time. 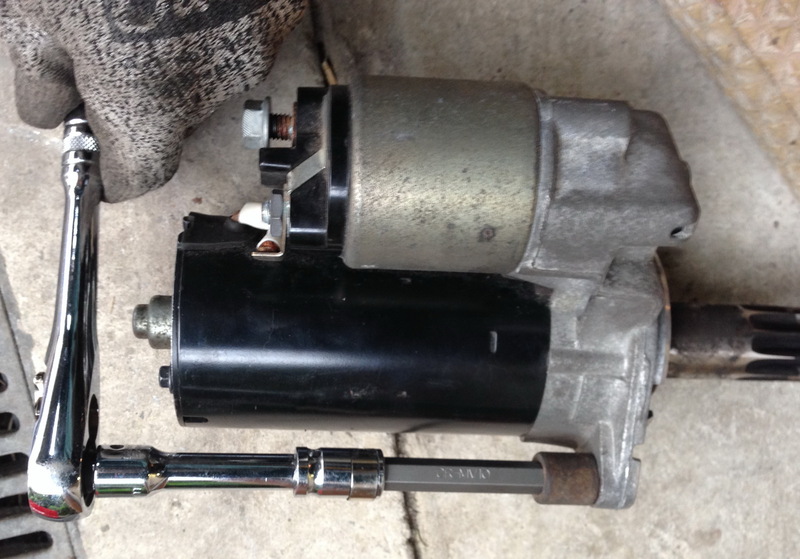 When I changed my starter motor I certainly did not remove the driveshaft - It was a bit a fiddle but it came out and went back in. I did cut my teeth on Lotus Elans so maybe I learnt how to work in confined areas. I used a similar combination of 3/8" drive with hex headed drive to remove the both setscrews. When putting them back in, I secured them with masking tape or similar to the hex drive to prevent them falling off as you feed them in using the socket extension. Oh the only tool that I had that you don't was a ramp. You can use a VERY long socket extension thought the suspension and out past the brake disk. Get someone to stand on the brake pedal while you undo one of the six driveshaft to gearbox bolts. Then turn the driveshaft to expose the next bolt and so on. This makes removing the driveshaft bolts quite easy since you can work from the side of the car rather than underneath. All good info as it's next on the list. The drive shaft had to come out to replace the inner boot. It was easier than I anticipated. Working solo I used a long pry bar on the wheel lugs to jam the hub. I used a 3 jaw puller on the bearing cage to pull it off after removing the circlip. The hub nut can be a struggle but a breaker bar and jack arm gave enough leverage. I have a big torque wrench to tighten it but failing that you can just tighten as much as poss then go to a friendly indie to finish.